Huawei has been teasing a handset that might have a camera cut-out in the screen rather than a bezel or notch, and now we've had a much closer look at the likely design. 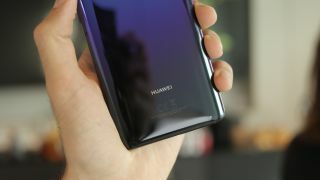 An image leaked by TrendingLeaks shows a phone with slim bezels and no notch, but a small circular cut-out for the camera near the top left corner of the screen. According to the leak this is the unannounced Huawei Nova 4, which based on previous leaks might have high-end specs, including 6GB of RAM and the Kirin 980 chipset that you'll find in the Huawei Mate 20 Pro. The leaked image doesn't reveal much of note other than the notch, especially as the phone appears to be in a case, so we can't even see clearly how big the bezels are. As with all leaks we'd also take it with a pinch of salt, but it looks convincing enough. We should get an official look at whatever Huawei has planned soon, as the teasers for the device point to a December announcement. It's worth noting though that while a pinhole camera will be a novel feature for now, it might not be for long, as Samsung seemingly has a similar phone planned. But it looks likely that Huawei's will be the first to launch.